If I were more clever, I would write this entire review in perfect iambic pentameter. But alas, the Shakespearian language doth escape me. And hitherto shows the brilliance contained therein. Okay, I’ll knock it off. But really, it takes a long freakin’ time to transcribe something into iambic pentameter. This book isn’t just about the thees and the thous, but within every penta are five perfectly aligned feet of iambs. And even more surprising is author Doescher’s ability to do this while still retaining the plot and feel of the original movie. Everything about this book impressed me. The cover and interior drawings are magnificently done; seeing Vadar adorned with a leopard printed boa? Yes, please. But what most enraptured my attention was Doescher’s painstaking attention to detail. I found myself searching for and highlighting his rendition of all my favorite movie quotes. From the opening prologue to the saber dual in the Death Star, everything has been faithfully rendered. Doescher was careful to stay within canon though we are greeted with impromptu cameo appearances (don’t worry, it fits appropriately) and no, he doesn’t reveal who shot whom first. This book is not for everyone. My excitement may have been a little too high when telling my co-workers about this recent find. Most of what I received in return was weird looks and names synonymous with geek and nerd. So, yes, this book is not for everyone. 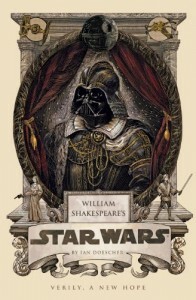 However, for those interested in Shakespeare or Star Wars, this is a most definite worthy read. It’s as if the seventeenth-century playwright was reincarnated just to breathe life back into this classic tale.